49 Almaden Homes, including short sales and bank owned homes for sale in the week ending December 31, 2011. 62 Almaden homes, including short sales and bank owned homes for sale in the week ending January 1, 2011. Of the 49 Almaden homes there were 8 San Jose Short Sales, 1 bank owned home and 40 traditional Almaden homes for sale. The number of short sales in the Almaden real estate market are relatively few in comparison to many other San Jose neighborhood communities. While short sales may be fewer in Almaden, the numbers of short sales are increasing. Almaden homeowners can avoid foreclosure by hiring an experienced San Jose Short Sale Agent. Call 408-972-1822 today for a free, no obligation consultation. What does this mean for the Almaden real estate market? Prices month over month and year over year continue to be down. 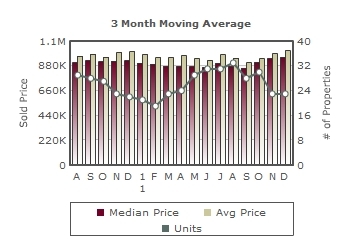 Inventory continues to decline It took longer for homes to sell in December. This may be attributed to the holidays. Although prices are down, the list price of homes in Almaden that went under contract in December held steady at nearly 99% of list price. While prices dropped nearly 9% from last year, it’s still a great time to sell homes in Almaden. Let supply & demand work for you. We still see multiple offers on competitively priced homes. This is especially true in Almaden Valley, a highly desirable community with top rated schools.